It is Pudina in Tamil… Mentha, more popularly Mint… a genus of plants …. Mint condition is an expression used in the description of pre-owned goods; the term could be used to describe items having excellent, like-new quality. Of the other meanings ~ a ‘mint’ is an industrial facility which manufactures coins for currency. This post may not be of interest to those who travel only by owned vehicles, shop with their credit cards or make online purchases only…. ~ for the other commoners ‘small change’ (சில்லறை ) often is the big problem. Those of us who utilize public transport; who buy vegetables, groceries, medicines and do other small shopping – for sure have realized this… everytime you conclude your purchase, you would have ran out of change. There are times when people get irritated by the offer of candies, chewing gums and the like – for making up the change. In fact, a couple of years ago, the Govt. thought the shortage of coins was so serious that it formed a high-level committee to investigate the gaps in demand and supply. Clearly, small coins have been in short supply. 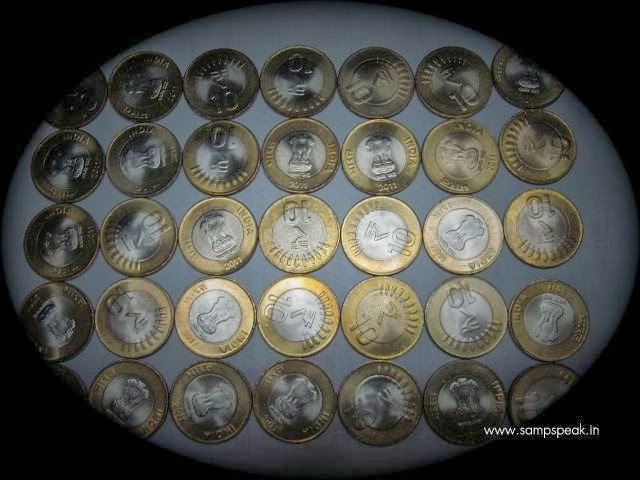 Effective 30th June 2011 - coins of denomination of 25 paise (and below !!) ceased to be of legal tender……. Hero (or Heron) of Alexandria (c. 10 – 70 AD) was an ancient Greek mathematician and engineer who was active in his native city of Alexandria, Roman Egypt. He is considered the greatest a windwheel, as also a vending machine… His machine accepted a coin and then dispensed holy water. When the coin was deposited, it fell upon a pan attached to a lever. The lever opened a valve which let some water flow out. The pan continued to tilt with the weight of the coin until it fell off, at which point a counterweight snapped the lever up and turned off the valve. A vending machine is a contraption which dispenses items such as snacks, beverages, alcohol, cigarettes, lottery tickets, cologne, consumer products and even gold and gems to customers - automatically, after the customer inserts currency or credit into the machine. We get to see vending machines at Airports / big Railway stations, where they dispense magazines …. automated milk vending machines are not totally new…. Remember that in many places in Chennai – Aavin had the facility of automated milk vending machines, where one needed to buy plastic tokens and when placed inside the machine, milk in prescribed quantity [1/2; 1 litre] used to flow… that was unpacked pasteurized milk and now Amul vends them in sachets. Now Chennai perhaps can breathe a little bit easy ! …. Thanks to the initiative by Reserve Bank of India and the banks across the country, the city will soon be having 65 coin vending machines (CVMs) at various bank branches. It is stated that coins will be available in denominations of Rs.1, Rs.2, Rs.5 and Rs.10. Bankers say two or three denominations of coins will be dispensed. 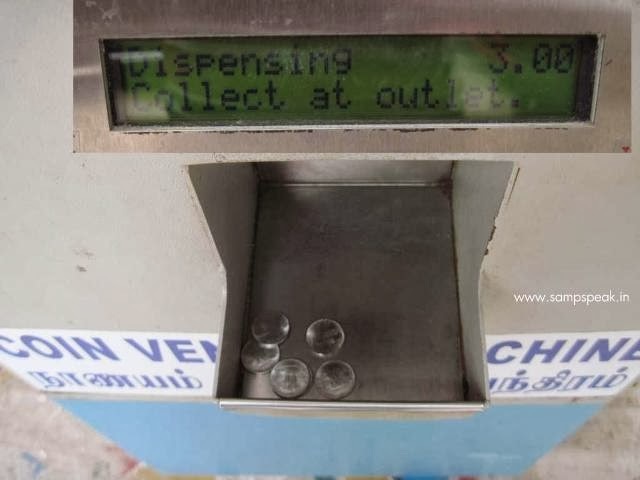 The maximum limit for using the coin vending machines is Rs.100. For long, beggars have been the suppliers of small changes to hotels and many shops. However, the supply base has been eroding and small coins are not available freely and Chennai now looks forward to 65 machines, set up by eight banks, installed at various branches in Chennai to make their life easier. 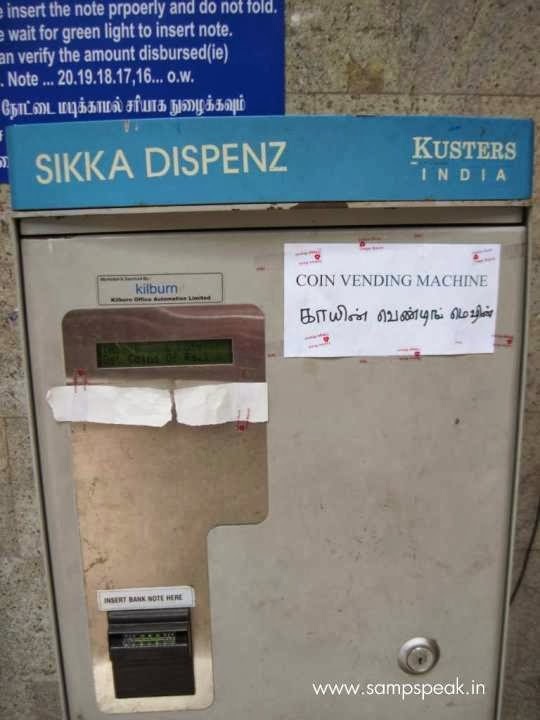 Again these Coin vending machines are also not new ~ I have seen one in good working condition operative at Indian Bank branch opposite to Panagal park, T Nagar. One issue with vending machines, particularly mechanical vending machines, involves the use of coins of foreign currency, or, in more regular cases, worthless tokens or washers which have the same size and shape as the coin accepted by the machine. Hopefully a good facility is not driven out by some ruthless elements. Concluding there is Mint Street, in Chennai - which starts near Central Railway Station making way across the city for about 4 km towards north and ends near Vallalar Nagar. It is named so, because a Mint to produce coins, existed during East India Company days at the end of this street.